I found the following article, Yoga as an effective option for pain relief by Paul D Osborne, on Ezine.com. Paul D Osborne gives some really good tips on improving scoliosis and pectus excavatum, which ties in well with what I recommend. I hope you find it useful, Joe. “Scoliosis is a condition in which a person’s spine [bends sideways and rotates along its vertical axis, in addition to its naturally curved shape]. The most effective remedy for such a condition is Scoliosis exercises. Although many exercises help in reducing the Scoliosis-related problems, yoga is considered the best. Yoga postures are helpful since they enable us to stretch our body. The most effective yoga exercises for the treatment of scoliosis-related problems include the Crocodile twist, the Supine knee chest twist, the Passive back arch and the One leg up-one leg out posture. These exercises are very helpful in raising one’s lowered shoulder and reducing the back pain. 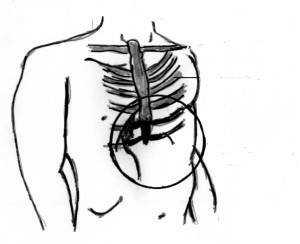 The Passive back arch scoliosis exercise has been found to be helpful in not only reducing scoliosis-related pain, but also the problems related to a condition called pectus excavatum (sunken chest). Pectus excavatum is generally caused by tight muscles across one’s chest and back, and soft bones in the rib cage and spine. The One leg up and one leg out scoliosis exercise has been found to be very effective in reducing muscular tension in legs. The Seated twist is a good remedy for the treatment of thoracic twist. This exercise also helps to rectify the alignment of the body and is simple to perform. Paul Osborne is the executive editor of www.backpain-resources-online.com and www.lowerbackpainrelief.org. Both sites offer a host of information, tips and advice for lower back pain relief. Get more help with this book too.